In this article, we are going to discuss the UPS pickup service and how you can use it for yourself. UPS is doing very well among their competitors USPS and FedEx and the reason behind its success is brilliant services it provides and we are going to talk about one of them in this article. Sometimes people don’t have time to go to the post office and deliver their package or sometimes package is too heavy to be taken so in that case you can schedule a pickup from the UPS and they will come to your given address and pick the package and take it with them with care so this way these services save your lot of time, as well as your sensitive package, is also protected. you sign up in My UPS and an account is saved in the preferences. If you have signed up account at My UPS and this account has different account type in account summary like Daily pickup, Daily ON-Route Pickup. you don’t have My UPS. Let’s start with the first case and follow the steps as given. 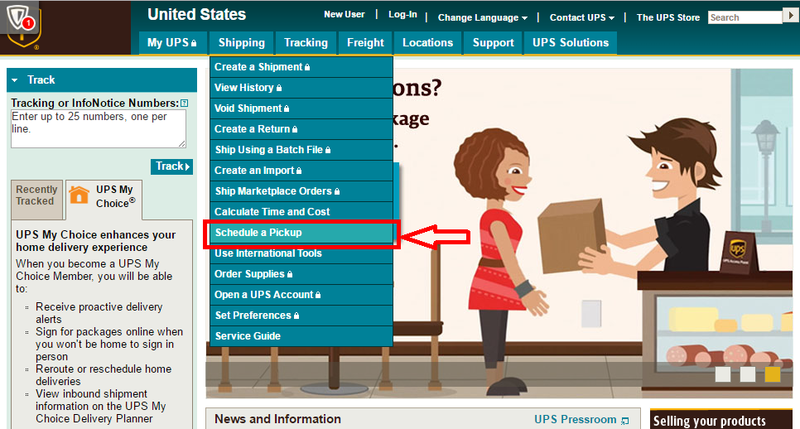 Select the ‘schedule a pickup’ option from the various options under the Shipping tab on the UPS official site ups.com. Refer below image in case of doubt. A form will be displayed in front of you having 6 parts and fill all the parts before proceeding to next step else it will show the error message. First section contain the questions related to shipping label, answer them and move to the next section. Below image showing part 1. In 2nd section of the form, clearly fill all the information related to pickup location likeaddress, account number, contact number etc. below is the image of section 2 of the pick up form online. The next section is about the package information. Mention the no of packages you want to be picked and what is the weight of them. Image shows the section 3. The next section of the online pickup form has the fields giving you option to fill the pick up date and time. Below image shows the glimplse of section 4. Provide the contact details like email address or contact numbers and addresses through which you prefer to get the UPS schedule pickup request confirmations. Below image shows the section 6 and last section of the form. After completeing the form, click the next button to proceed then click next to get your pick up request number and pick up confirmation. Step 1: Select the ‘schedule a pickup’ option from the various options under the Shipping tab on the UPS official site ups.com. Step 2: Pick any suitable method of payment from the menu and then proceed to next step. Step 3: First section contain the questions related to shipping label, answer them and move to the next section. Step 4: In 2nd section of the form, clearly fill all the information related to pickup location like address, account number, contact number, etc. Step 5: The next section is about the package information. Mention the no of packages you want to be picked and what is the weight of them. Step 6: The next section of the online pickup form has the fields giving you option to fill the pick up date and UPS pickup times. Step 7: Provide the contact details like email address or contact numbers and addresses through which you prefer to get the UPS schedule a pickup request confirmations. Note: You may refer images of form from case 1. Step 1: Select the ‘schedule a pickup’ option from the various options under the Shipping tab on the UPS official site ups.com. Refer image 1. Step 2: First section contain the questions related to shipping label, answer them and move to the next section. Step 4: In 2nd section of the form, clearly fill all the information related to pickup location like address of UPS pick up point, account number, contact number etc. Step 6: The next section of the online pickup form has the fields giving you option to fill the pickup date and time. 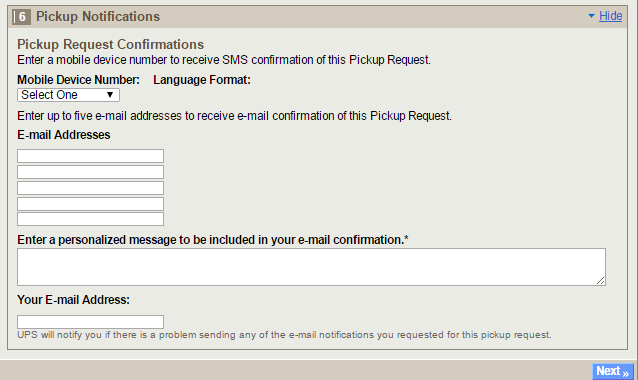 Step 7: Provide the contact details like email address or contact numbers and addresses through which you prefer to get the UPS package pickup request confirmations and select next to proceed. Step 8: Enter you payment details and click next to proceed to pickup request verification. Step 9: Click next to obtain pickup request no. and conformation. Go to the Official site of the UPS. Select the Shipping bar from the tab. Click on the ‘Schedule a pickup’ option from the drop down menu. You may refer image 1 in case of doubt. Select the ‘Pickup Request Status’ option from the left side menu as shown in image. A page will be open which have a field asking to fill your Pickup request number. Fill it and click the submit button. You will get the status regarding your pickup request. You can also see UPS pickup schedule history also what you have to do is just select the schedule a pickup from the shipping tab on the oddicial ups website and at the left side you will see the option ‘pickup history’, clicking on which it will ask you to log in with you My UPS account. Select the option to see the history of your UPS pickup. In the history you will get to see the shipment date, pickup request number for every pickup. Click on the ‘Schedule a pickup’ option from the drop down menu. You may refer below image 1. Select the ‘Pickup Request Status’ option from the left side menu. Select the ‘Modify Pickup’ option. Refer the “Image: UPS pickup status history”. A page will be open where you can edit information according to your preference and after that, your updated information will be visible. Note: Before modify or adding new information, make sure your new information is correct. Click on the ‘Schedule a pickup’ option from the drop down menu. You may refer below image in case of doubt. Select the ‘Cancel Pickup’ option if you want to cancel any previous pickup request. Select the schedule a pickup option from the drop down menu of the shipping tab on the UPS site. Refer Image 1. On the left side select the option ‘Request a UPS Smart Pickup’ and a new window will be open. Fill the detail account number and UPS account ZIP code in order to get the UPS smart pickup. These details are just for security purpose only. Day-Specific Pickup- This type of pickup option is suitable for the people who uses the shipping service only on the specific days. So in this, you can select your predecided business days and the driver will collect your pickup from the mentioned location on every predecided day but make sure your days should not exceed more than 4 business days as UPS don’t allow this pickup facility for more than 4 business days. This service is available from Monday to Friday business days at any UPS location and service charge apply will be based on the number of days for this service is selected. The next pickup is automatically scheduled everytime so it will save your time in real. Daily On-Route Pickup- This type of pick up facility is suiatable for the people who need daily pickup but are okay with the flexible pickup times. So driver will pick the shipment daily whenever he will be in that area. This service is available from Monday to Friday business days at any UPS location and service charge apply on weekly basis. Daily Pickup- This is the suitable pickup service for people who are in need of daily pickup options. The driver will daily pick the shipment from the mentioned address on time. One of the benefit of this type of service is it gives you a piece of mind as well as you will get weekly charges not the daily. Thes service is avialabele for all the UPS locations. UPS On-Call Pickup- This type of pickup option is suitable for people who require pickup facility occasionally and on demand. So you can make a call on UPS pickup number 1-800-PICK-UPS or you can also schedule your pickup at UPS website whenever you need a pickup service. The best thing about this service is that it has very low fees and that is because UPS charges for per pickup basis not for every package. Also make sure that for which area you want the pickup facility because UPS charges some extra fees for the pickup facityt at the area designated as rural or remote area. Note: These options are available for all the type of packages- ground, air or international. Conclusion: You can easily ship your package right from your home by using UPS pickup facility online and this will actually save your time also and help you to find UPS pickup near me. Apart from scheduling you can also get the pickup status right on your systems and in case of any doubt you can also cancel or modify your pickup request detail online. So next when you will need any pick up facility, try the UPS. If you have any query regarding UPS pickup, please comment in the comment box below. I would like to schedule a pick up, I have 2 packages. I would like to schedule a pick up I have 1 pkg. Unfortunately I have had several kinks in my effort to return a package using Home pickup. I re-submitted my request again today for pickup tomorrow, Aug 30, 2018 anytime before 7p.m. I have little confidence that this will be accomplished. I’ve worked with several customer services with conflicting directions as to what I’m required to do.